also (double post, sorry, first one from yesterday so I thought this was justified), when BDT shows Finn that the guy who owned the ship they stole sold weapons to both the "bad guys" and the "good guys." Important lesson/moment in general and for Finn. - Snoke's death and the fight with the guards was epic! - Holdo's lightspeed jump was breathtaking! - Kylo: "The supreme leader is dead." Hux: "Long live the supreme leader." - "See you around kid"
I loved all Reylo scenes.. But the hand scene was perfection! Though it isn't mentioned later and Leia claims she gave up on Kylo, I found the scene where Kylo refused to shoot at her really moving. When I first saw it in the trailer, I immediately thought it would be that he would be conflicted and hesitate too long, so somebody else would swoop in and take the shot. That is what happened in TLJ, but it was actually taken a step further than I thought it would be. Kylo didn't just hesitate, he took his thumbs OFF the triggers. He chose definitively not to shoot at his mother. In fact, I think it may just be the only undeniably right choice that Kylo has EVER made for as long as we've seen him. I think it deserved a lot more attention and significance in the movie than it had. I really loved the first throne room scene with Snoke and Kylo. That was such a mirror on how Kylo was percieved from fanboys. He did what Vader and Luke couldn't do - killed his father and yet only because he lost to Rey, they considered him weak. They laughed at his mask and called him a whiny prick in the mask. And here Snoke basically says the same - calling him a child and softie and not being able to be as Vader. And Kylo did give everything to the darkness and yet that was not enough. It's like you go to a friends party you don't want to go and the friend starts roasting you for something and you feel betrayed that you even went there in the first place. And then I just love how he looks - so angry and hurt and the hair is a mess and the face is all messed up. And then he stands up against Snoke and just gets electrocuted away. Damn, I love that scene. I think I should rewatch just because of it alone. @SheLitAFire wrote: also (double post, sorry, first one from yesterday so I thought this was justified), when BDT shows Finn that the guy who owned the ship they stole sold weapons to both the "bad guys" and the "good guys." Important lesson/moment in general and for Finn. I really liked this scene. Along with Rose's "saving what we love" line, that scene represents the core of the movie. War is a business and there are no bad guys or good guys; everyone is equally guilty. 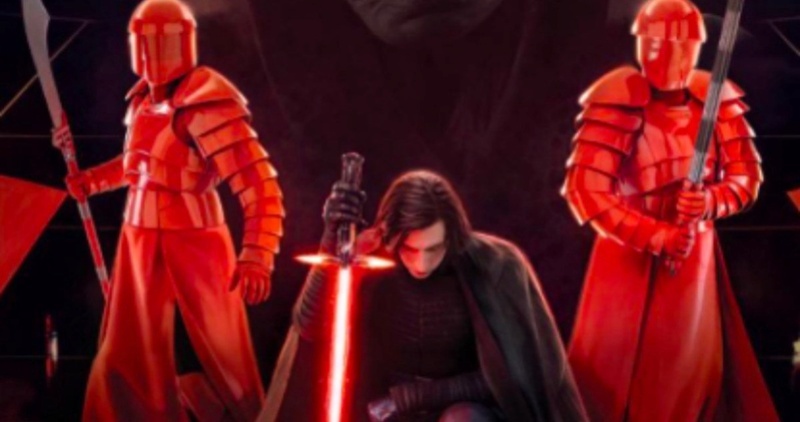 @SkyStar wrote: I really loved the first throne room scene with Snoke and Kylo. That was such a mirror on how Kylo was percieved from fanboys. He did what Vader and Luke couldn't do - killed his father and yet only because he lost to Rey, they considered him weak. They laughed at his mask and called him a whiny prick in the mask. And here Snoke basically says the same - calling him a child and softie and not being able to be as Vader. I loved that part too. Kylo was a mess there but at the same time intense and passionate, especially later in the elevator scene. Before he smashes the mask in the elevator, his face is just like my 5 year old's right before he bursts in to tears Broke my freaking heart. "You will not bow before Snoke." Ironically their last scene together is Kylo bowing to her through the Force Bond before she slams the door. kylo: "you need a teacher, let me show you the ways of the force." Luke: "you need a teacher. I can't teach you." Would it be too much to ask if Kylo gave Force Skype lessons in IX? @FrolickingFizzgig wrote: You know what was awesome? It's hard to choose, because there's so many memorable scenes in this movie, so many favourites. Well, I loved many scenes (mostly you guys already mentioned), but I will pick two that really touched me. ✩ The first scene of Kylo and Snoke, when Snoke humiliates him. Kylo was so vulnerable there, it was heartbreaking. Even wearing his mask, Kylo's voice sounded strangled when he said, "I gave everything I had to you, to the Dark Side". And then Snoke told him he was no Vader, just a kid in a mask. ✩ When Holdo jumped into hyperspace and sliced Supremacy's wing. The scene was magnificent and I found terribly beautiful to see it without sound, as it would have really happened in real life. The scene when Rey ships to the Supremacy. When Snow White in her glass coffin realizes that the white thing behind the prince is not the horse, but 2 stormtroopers with handcuffs. She sees them slightly before the audience and her expression goes from serene and hopeful to WTF, oh no!!! No words needed. Captain Canady on the Dreadnaught was great. His sneer right before his death was perfection. Holdo's sugar sweet tone, but frosty attitude towards Poe when she first takes over "and stay out of my way"
@SheLitAFire wrote: Captain Canady on the Dreadnaught was great. His sneer right before his death was perfection. Holy crap I’m blown away at the bolded. I DID NOT NOTICE THAT!!! I still can’t get over how many think Ben will die when literally Dark HAS to exist to complete the balance. Heck we may not even get a fully redeemed Ben Solo at the end, but instead I expect this story to be more about acceptance and Rey and Ben loving each other for who they are, flaws and all. I have many many favorite scenes- but I think I loved their first Force-Skype session the most. but the most touching was when he said "can you see my surroundings ? I can't see yours - just you." not what he said but his facial expression during those words- he was so in awe and...ah cute? For lack of a better word. And I found it also hilarious how she was insulting and threatening him, while he is calm and just wondering how and why the force Skype thing works. If you pay attention to his face I just can't understand how you can come to the conclusion he was just using her or tricked her into coming. No way! @Night Huntress wrote: I have many many favorite scenes- but I think I loved their first Force-Skype session the most. I agree, he has such imploring eyes, which become very wide and round when he says ‘just you’ I do think Kylo Ben close ups of his face and expressions is one of my favourite parts as they have so many shades of meaning. Luke to Rey on Ahch-To: "every word you just said is wrong"
Luke to Ben on Crait: "every word you just said is wrong"
@SheLitAFire wrote: Luke to Rey on Ahch-To: "every word you just said is wrong"
I don't know if I would like Luke as a teacher. Though he could be the one that if he praises you, then you feel as the smartest person alive. Look how afraid and relieved Kylo looks after he thinks that he killed Luke. Ahhhhhhh. It's so easy to miss such detail in the cinema or in bad quality.